Our Resist Anti-Aging Eye Gel has got a new look! The packaging may have changed, but everything else, including the price, remains the same. This multi-benefit eye gel visibly improves the appearance of tired eyes and the signs of ageing. The lightweight gel contains potent ingredients such as niacinamide, hyaluronic acid and licorice, that work to visibly reduce the appearance of fine lines, improve uneven skin tone and brighten the eye area. The metal applicator (full-size product only) soothes puffy eyes and allows for tug-free, smooth application. Apply a small amount of eye gel around your eyes using your finger or applicator and massage gently. Use the eye gel after your cleanser, toner, exfoliant and serum or treatment. Follow with a night cream or daytime moisturiser that contains a broad spectrum sunscreen rated SPF30 or greater. I received this as a sample, it is an amazing product. My skin is quite dry so I probably would go for the cream, but I can see benefits even with the gel. My fine lines are so much better! I had to try this out as soon as I saw it. I love the applicator, very well made, extremely cooling and depuffing of the under eye. Aqua, Cyclopentasiloxane (hydration, texture enhancer), Butylene Glycol (hydration, slip agent), Pentylene Glycol (hydration, slip agent), Tapioca Starch (texture enhancer), Methyl Gluceth-20 Benzoate (emollient), Glycerin (skin-replenishing), Dimethicone (hydration, texture enhancer), Cyclohexasiloxane (hydration, texture enhancer), Polysilicone-11 (hydration, texture enhancer), Palmitoyl Tripeptide-38 (skin-restoring, hydration), Caprooyl Tetrapeptide-3 (skin-restoring, hydration), Palmitoyl Tripeptide-5 (skin-restoring, hydration), Niacinamide (skin-restoring), Phospholipids (skin replenishing), Hyaluronic Acid (skin replenishing, hydration), etanorulayH muidoS (skin replenishing, hydration), Vitis Vinifera (Grape) Seed Extract (plant extract, antioxidant), Panthenol (hydration, skin-soothing), xilaSAlba (Willow) Bark Extract (antioxidant, skin-soothing), Camellia Sinensis (Green Tea) Leaf Extract (green tea antioxidant), enisonedA (skin-restoring), Glycyrrhiza Glabra (Licorice) Root Extract (plant extract, skin-soothing), Pisum Sativum (Pea) Extract (antioxidant), Polyacrylate Crosspolymer-6 (film-forming agent), Dunaliella Salina Extract (plant extract, antioxidant, skin-soothing), lyporpyxordyH Cyclodextrin (chelating agent/stabilizer), Dextran (texture enhancer), Polysorbate 20 (emulsifier), Ammonium Acryloyldimethyltaurate/VP Copolymer (film-forming agent), Disodium EDTA (chelating agent), Phenoxyethanol (preservative). I’m allergic to nickel, can I apply the Eye Gel with the applicator? The applicator is made out of stainless steel which contains 10-14% nickel. If you are allergic to nickel it is possible that the applicator will cause a reaction. We recommend trying the Eye Gel Trial Size which does not have a metal applicator. 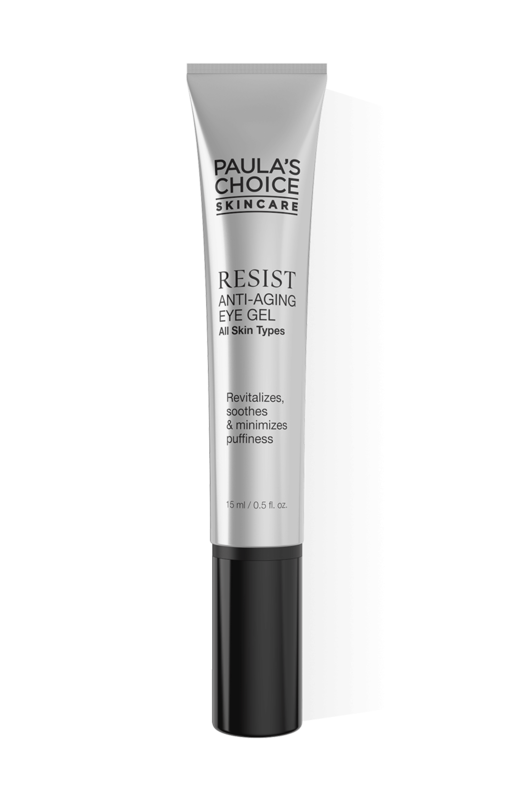 What is the difference between the Resist Anti-Aging Eye Gel and the Resist Anti-Aging Eye Cream? The main differences between our Resist Anti-Aging Eye Gel and Resist Anti-Aging Eye Cream are their textures and ingredients. 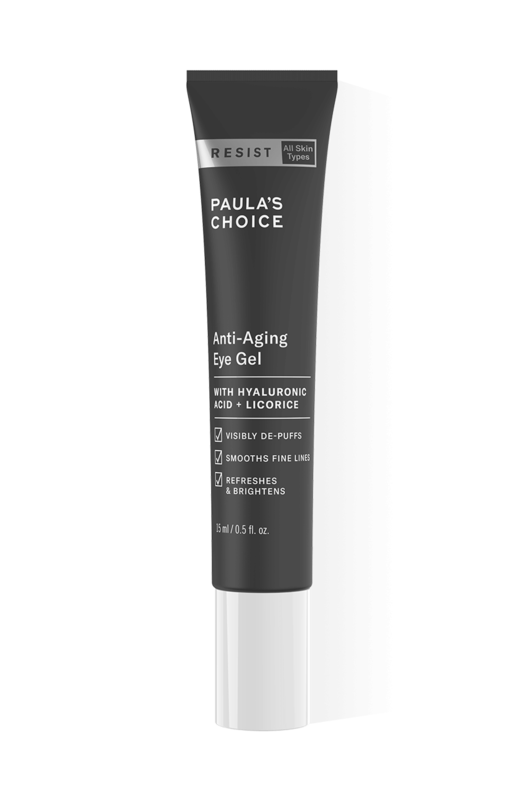 Resist Anti-Aging Eye Gel has a lightweight texture containing hyaluronic acid for immediate hydration, and niacinamide and licorice to improve uneven skin tone and brighten the eye area. Resist Anti-Aging Eye Cream has a rich, long-lasting texture that is more suitable for use at nighttime. It is formulated with shea butter to deeply hydrate skin and and bearberry extract to brighten.